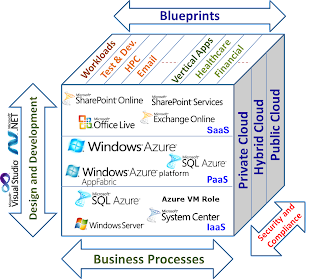 Purposeful Clouds: Microsoft in the Clouds with Windows Azure Platform? Microsoft in the Clouds with Windows Azure Platform? As expected, the well known software called "Operating System (OS)" has expanded into managing its own previous incarnations and a lot more. We can call this new expanded software "CloudOS". This software not only manages the traditional compute, storage, networking, and millions of different peripherals across multiple geographies around our planet but also supports on-demand scaling, metered pricing, access, virtualization, collaboration, and control. In the Cloud, as we know now, CloudOS and related hardware (metal) are referred to as Infrastructure as a Service (IaaS). Increasing adoption rate of this new computing paradigm by both early and mainstream adopters is a convincing proof that the Cloud "delivers a lot more for a lot less". However, this progress will be of very limited value if proportionate advances are not made in enabling developers to take advantage of IaaS. A higher level of abstraction in the Cloud, called Platform as a Service (PaaS), promises to help developers get the most out of IaaS. This is partly accomplished by PaaS delivering support for ubiquitous access to both the existing and new software tools, web services, libraries and processes as well as usage based pricing. The prime concern of businesses is how their services perform. As we know, these services are delivered via applications, also referred to as workloads. It is logical to expect that these services in the Cloud, called SaaS (a topic for a future blog), highly leverage PaaS and IaaS to enable a new application software services business model. 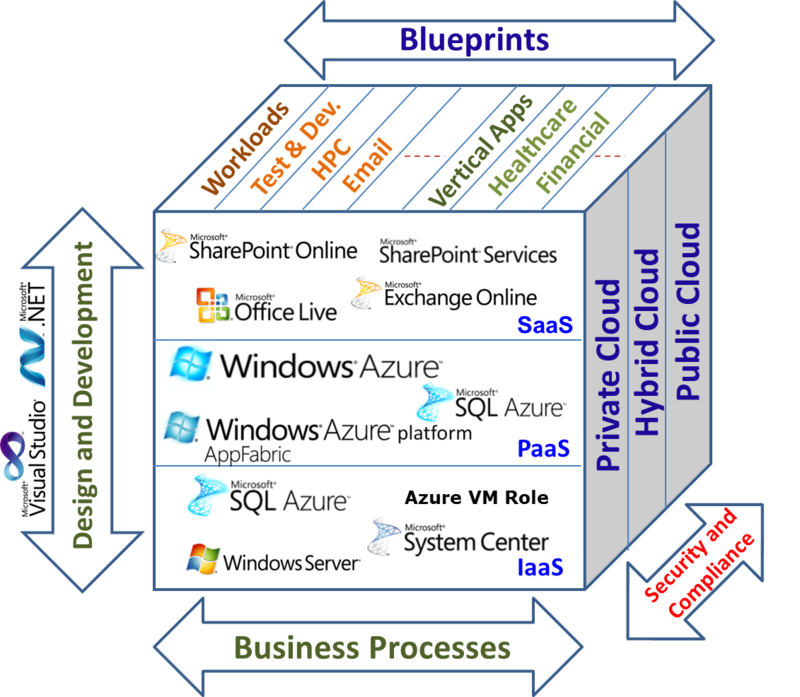 Windows Azure platform, that represents the central focus of Microsoft strategy, in many ways epitomizes the best of PaaS and IaaS. On the surface it may seem impractical to aggressively innovate as well as responsibly carry forward the existing Microsoft’s base of many millions of applications, developers, and users to the latest technologies. However, without a doubt, Windows Azure platform does represent such a bold step. To better understand how Windows Azure platform can help you simplify your journey to the Cloud, you need to consider whether you want to move, transform, or enhance existing applications for the Cloud or develop new applications. Also, you need to identify what Cloud model is best suited for your business needs today, six to nine months from now, 1-2 years from now, and longer-term. The following figure helps characterize some key scenarios while you assess and identify applications or workloads as candidates for moving them to the Microsoft Cloud. Each arrow represents more leverage of Cloud services. Arrows of the same color represent possible migration paths to leverage even more of the Cloud computing paradigm. Today, Windows Azure platform supports most of the paths leading to Public or Virtual Private Clouds while Microsoft is also working on supporting Private Cloud model with "Windows Azure in a box" appliance. We plan to closely track Microsoft’s progress into the Cloud and share with you our perspectives along the way. Please let us know your views and experiences with Windows Azure by posting your comments on this blog. You can also get more detailed analysis of the Windows Azure platform by attending Boston Azure User's Group meeting on November 18th.